Launchpad couldn't connect to Mozilla Bugzilla. In the search box, the icon of the current search engine is displayed but if you look at the drop down list there is no icon ! Adds the search icons again. Martin, you should ask a specific person for review. Dao could be the right one. 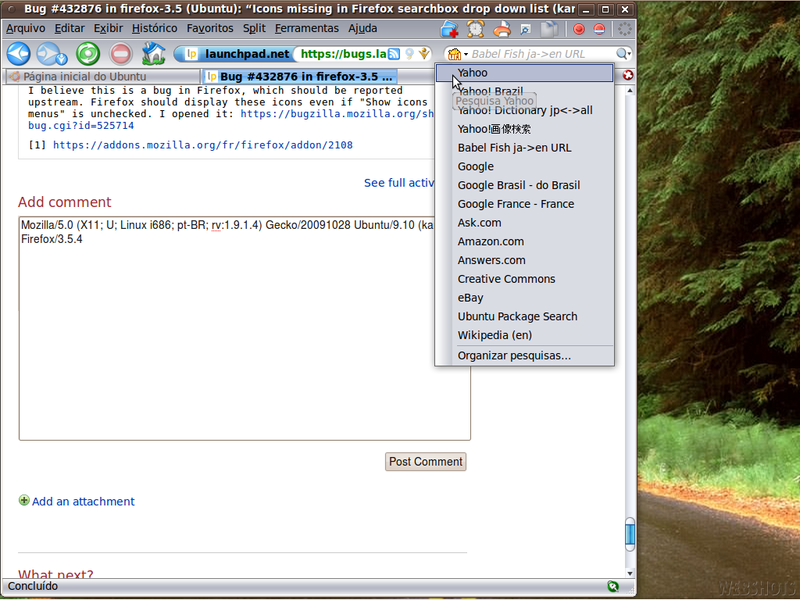 Without knowing the version you are using of any package, i changed firefox to firefox-3.0. I dont think your problem is related to bug #407621 since you dont mention any other menu not having them. Can you please attach a screenshot of the problem you are seeing. i have the same issue with firefox-3.5 in karmic beta. It seems a GTK issue because it doesn't happen in Kubuntu Karmic and even the system menu might be affected because there are no icons too. Ok, this is a duplicate of Bug #407621. After activating the Gnome option icons are there again in Firefox. The icons are back on my system after the latest updates, so this seems to be fixed now. This was definitely not a duplicate of Bug #407621, though. I had this enabled before. I don't really have a strong opinion. Assuming it works, that patch seems fine to me. Does anybody still have this problem? If not, I consider this fixed. I upgraded from 9.04 to 9.10 a few days ago and have the same problem. I did a full dist-upgrade today, so firefox and libraries should be actual. please see the screenshot enclosed! btw: shouldn't this bug be filed at firefox 3.5 instead of firefox 3.0? Please install firefox-3.5-gnome-support and if using firefox-3.0 install firefox-3.0-gnome-support and let us know if this is gone. It also seems that not everyones bug is the same since 1 or 2 people fixed it by doing something and the others did not fix it. same here, missing icons in dropdown search box of ff. Could it be, that this bug has something to do with the language pack? I do not have the german language pack installed at the moment, but I am still affected by the bug, so I don't think that there's a connection. The problem no longer affects me with the newest updates installed. I've the same versions installed as Adam, but still don't don't have any icons in the searchbox drop down list. Live system 9.10 beta shows same effect (for me)! Today I grabbed the latests 9.10 beta iso (ubuntu-9.10-beta-netbook-remix-i386.iso) installed it on a USB-stick and started the live system on a Asus Eee PC 901. I choose the default language English and started the Firefox browser, to my surprise I still got no icons in the searchbox drop down list. I've an Intel graphics card (GM945/GM950) on both computers I've tested this, maybe that's the common ground? Does anyone that _doesn't_ have the bug (i.e., _does_ see the icons) have System -> Preferences -> Appearance unchecked, as is default? There are basically two ways of fixing this bug. 1) As stated before, under System -> Preferences -> Appearance check "Show icons in menus". After restarting Firefox, the icons should be there again. note: remove "#search-popupset" if you want the icons in all Firefox menus. It will probably not block, but bringing attention to drivers so we could get at least an approval for 1.9.2. Henrik; the better way to bring it to drivers' attention is to email me a list of bugs that you think are safe for approval, along with quick rationale. We see a couple of complains from users who run Firefox 3.5.x on a current Ubuntu release where those icons are not displayed. Can we get this fix into 1.9.1 to show all of the search engine icons again? This has been fixed in Firefox 3.6 an we are attempting to get this in Firefox 3.5 as well. > you look at the drop down list there is no icon ! We're not going to take polish fixes on 1.9.1. > We're not going to take polish fixes on 1.9.1. Yeah, I think we should take this. I don't know if this is another effect of the same bug but my search engines got all mixed up in the drop down list on every computer I upgraded to Karmic. The fix has been approved for Gecko 1.9.1.8, which should mean Firefox 3.5.8. Firefox 3.5.8 is currently undergoing QA and is scheduled for release on February 16, 2010.
mercedes: please don't change the status without commenting why. Please don't assign yourself bugs unless you are working on them. If this bug would ever regress, it will be highly visible. I don't think that it qualifies for a Litmus test.